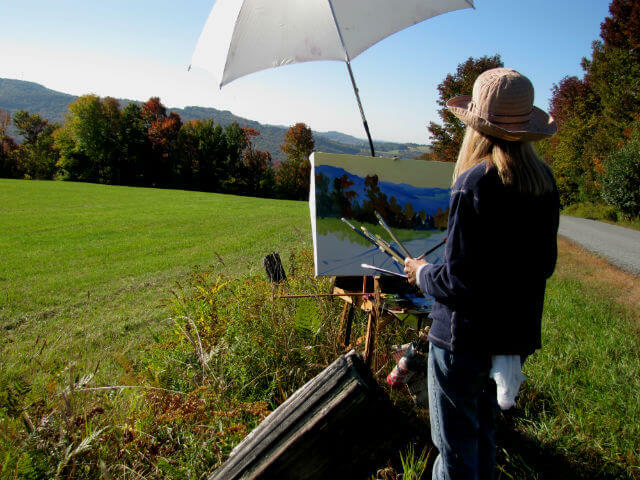 I often contemplate what the real relationship my plein air landscapes have to my mythic figurative work. On one level they seem unrelated. But if one looks deeper there is a real and substantial bond between the two forms of creative activity. My figurative work is very much tied to allowing my imagination free reign to make connections or free associations between my own personal creative energy and a more archetypal energy. I then take these images and slowly give them form and in the process refine them to a point where I feel there is an underlying truth and vitality to them. They speak to me personally yet contain a universality that speaks of more than my own personal experience. When I am out in the world painting a landscape, I allow my imagination freedom to contemplate and wander where it wishes. A sort of reverie that is activated by place as well as by the very activity of looking, mixing and applying paint with brushstrokes in just the right place. This activity is all-consuming to the point where I feel elevated like a bird who has just stretched open its wings to gently catch the wind. I feel as though I possess the whole world here and now like I imagine a child feels everyday until they change and grow up. Painting for me is repossessing that feeling of new beginning as my personal memories of childhood seemed to be. In this state I have come to realize that the landscape is an imaginative form that allows a place for the artist to dwell. The landscape is really a form of the self-portrait. The landscape is the un-molded element that finds its form through the emotional content I bring to it. A landscape needs this emotional resonance of the artist in order for us to care to look at it. Whereas, a figure or a portrait is a meeting place of two souls and the expression of that point of contact is the painting itself. But the landscape cannot express itself. I am the one, solely, who is telling of its impact on me. It is strictly through my own lens. I can say the same of a portrait. This is how I see this person. But there will always be conveyed the power of the other. That person has their own beauty and poetic charge that I am experiencing and relating to you through paint whether I am conscious of it or not. But the landscape can really only find its voice when the artist is emotionally charged by it. It becomes the vessel by which one takes a voyage to an imaginative place, where one is possessed by soul that colors that world like a setting sun. It is why Van Gogh’s work is so evocative. We look and we see him there at the edge of that field in all his joy and sorrow. That is the only reason I am attracted to that cottage, field or olive tree- because he is there and I share in his mental and spiritual state through that particular place. The artist is the cartographer that provides the map not only of the geography of hill and vale, but of soul. And my soul, as the viewer, is enriched in a way that I can barely comprehend, yet am transfixed by. The unifying factor of an artist’s work is the vector of the imaginative force that underlies his intuitive search for meaning. There, in fact, is no separation between any activity one undertakes with earnestness. All is one. It is really our compartamentalizing of our life that fractures the image of wholeness that is there of itself. So painting this landscape or that figurative piece or digging that garden or cooking that meal are all unified by you and your vision of the world.